EXTINCTION MACHINE is the fifth novel in Jonathan Maberry’s Joe Ledger series involving a retired Boston P.D. cop who finds himself at the business end of the Department of Military Sciences. As the leader of Echo Team, Joe is always running full speed into the kinds of things nobody else wants to play with. These are the guys the big guns call in when the situation starts to get out of hand. And when I say out of hand, I’m talking in a bad way: zombies, weaponized eugenics, the ten plagues of Egypt, vampires… that kind of stuff. In EXTINCTION MACHINE Joe is charged with the job of tracking down the President of the United States and bringing him back home after he is taken from the White House right under the nose of the secret service. The only clue being the curious, geometric crop circle pressed into the lawn out front. In the wake of it all, the DMS’ biggest threat, Vice President William Collins, assumes the role of Commander in Chief and pins the whole thing on suspected terrorist, our hero, Captain Joe Ledger. In reality, though, Collins just wants Mindreader. But as long as it remains the personal property of Mr. Church, he’s got no leverage. So, he does what any good leader would do; he paints Joe as the bad guy and goes after it with guns. As if this day hadn’t gotten bad enough yet, there’s also the issue of the North Koreans, the Chinese, and the rogue, top-secret initiative group M3 all racing to reverse engineer the technology scavenged from the several UFO crash sites around the world in an effort to end the global arms race once and for all. Also the aliens who want their stuff back. And oh, yeah, did I mention the pigeon drones that can detonate with almost nuclear force? Yeah, those are in there too. 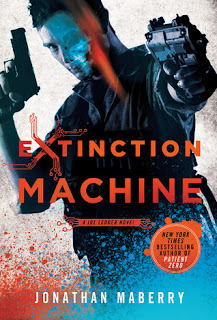 Out today from Jonathan Maberry and St. Martin’s Press, you can pick up your copy of EXTINCTION MACHINE and find out who or what wants the Majestic Black Book and is willing to destroy the world to get it.